Establishing proper policy foundations, combined with public support and effective leadership, will better place Australia on a trajectory for national well-being. 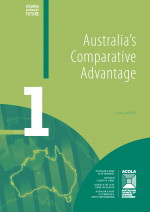 While change is challenging, the benefits of systematic reform and investment in our future to build Australia’s comparative advantage will mean higher living standards, increased equity and greater sustainability. Project services provided by ASSA on behalf of ACOLA.